Buddhism in Indonesia has a long history, with a considerable range of relics dated from its earlier years in Indonesia. 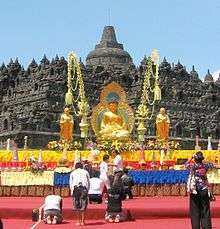 Buddhism is recognized as one of six official religions in Indonesia, along with Islam, Christianity (Protestantism and Catholicism), Hinduism and Confucianism. According to the 2000 national census, roughly 0.8% of the total citizens of Indonesia were Buddhists and numbered around 1.7 million. Most Buddhists are concentrated in Jakarta, Riau, Riau Islands, Bangka Belitung, North Sumatra and West Kalimantan also have a significant number of practitioners. However, these totals are likely high, because practitioners of Taoism and Chinese folk religion, which are not considered official religions of Indonesia, referred to themselves as Buddhists on the census. Today, most Buddhists in Indonesia are Chinese, however small numbers of native (such as Javanese and Sasak) Buddhists are also present. Buddhist expansion from northern India to the rest of Asia, Srivijaya once served as a center of Buddhist learning and expansion. Buddhism is the second oldest religion in Indonesia after Hinduism, arriving around the second century. The history of Buddhism in Indonesia is closely related to the history of Hinduism, as a number of empires influenced by Indian culture were established around the same period. The arrival of Buddhism in the Indonesian archipelago was started with the trading activity that began in the early of first century on the maritime Silk Road between Indonesia and India. The oldest Buddhist archaeological site in Indonesia is arguably the Batujaya stupas complex in Karawang, West Java. The oldest relic in Batujaya was estimated to originate from the 2nd century, while the latest dated from the 12th century. Subsequently, numbers of Buddhist sites were found in Jambi, Palembang, and Riau provinces in Sumatra, and also in Central and East Java. Indonesian archipelago has witnessed the rise and fall of powerful Buddhist empires such as the Sailendra dynasty, the Mataram and Srivijaya empires. According to some Chinese source, a Chinese Buddhist monk I-tsing on his pilgrim journey to India, witnessed the powerful maritime empire of Srivijaya based on Sumatra in the 7th century. The empire served as a Buddhist learning center in the region. A notable Srivijayan revered Buddhist scholar is Dharmakirti, a Srivijayan prince of the Sailendra dynasty, born around the turn of the 7th century in Sumatra. He became a revered scholar-monk in Srivijaya and moved to India to become a teacher at the famed Nalanda University, as well as a poet. He built on and reinterpreted the work of Dignaga, the pioneer of Buddhist Logic, and was very influential among Brahman logicians as well as Buddhists. His theories became normative in Tibet and are studied to this day as a part of the basic monastic curriculum. Other Buddhist monks that visited Indonesia were Atisha, Dharmapala, a professor of Nalanda, and the South Indian Buddhist Vajrabodhi. Srivijaya was the largest Buddhist empire ever formed in Indonesian history. A number of Buddhist historical heritages can be found in Indonesia, including the 8th century Borobudur mandala monument and Sewu temple in Central Java, Batujaya in West Java, Muaro Jambi, Muara Takus and Bahal temple in Sumatra, and numerous of statues or inscriptions from the earlier history of Indonesian Hindu-Buddhist kingdoms. During the era of Kediri, Singhasari and Majapahit empire, buddhism — identified as Dharma ri Kasogatan — was acknowledged as one of kingdom's official religions along with Hinduism. Although some of kings might favour Hinduism over another, nevertheless the harmony, toleration, and even syncretism were promoted as manifested in Bhinneka Tunggal Ika national motto, coined from Kakawin Sutasoma, written by Mpu Tantular to promotes tolerance between Hindus (Shivaites) and Buddhists. The classical era of ancient Java also had produces some of the exquisite examples of Buddhist arts, such as the statue of Prajnaparamita and the statue of Buddha Vairochana and Boddhisttva Padmapani and Vajrapani in Mendut temple. In the 13th century Islam entered the archipelago, and began gaining foothold in coastal port towns. The fall of Hindu-Buddhist Majapahit empire in late 15th century marked the end of dharmic civilization dominance in Indonesia. 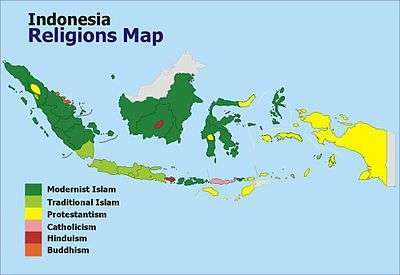 By the end of the 16th century, Islam had supplanted Hinduism and Buddhism as the dominant religion of Java and Sumatra. After that for 450 years, there is no significant Buddhist adherence and practice in Indonesia. Many of Buddhist sites, stupas, temples, and manuscripts are lost or forgotten, as the region has become more predominantly Muslim. During this era of decline, there was only small numbers of people practicing Buddhism, most of them are Chinese immigrants that settled in Indonesia with migration wave accelerated in the 17th century. Many of klenteng (Chinese temples) in Indonesia are in fact a tridharma temple that houses three faiths, namely Buddhism, Confucianism and Taoism. In 1934, Narada Thera, a missionary monk from Sri Lanka, visited Dutch East Indies (today Indonesia) for the first time as part of his journey to spread the Dharma in Southeast Asia. This opportunity was used by a few local Buddhists to revive Buddhism in Indonesia. A Bodhi tree planting ceremony was held in Southeastern side of Borobudur on 10 March 1934 under the blessing of Narada Thera, and some Upasakas were ordained as monks. Following the downfall of President Sukarno in the mid-1960s, Pancasila was reasserted as the official Indonesian policy on religion to only recognise monotheism . As a result, founder of Perbuddhi (Indonesian Buddhists Organisation), Bhikku Ashin Jinarakkhita, proposed that there was a single supreme deity, Sanghyang Adi Buddha. He was also backed up with the history behind the Indonesian version of Buddhism in ancient Javanese texts, and the shape of the Borobudur Temple. During the New Order era, the state ideology of Pancasila listed Buddhism among the five official religions of Indonesia. The national leader of the time, Suharto, had considered Buddhism and Hinduism as Indonesian classical religions. The first Theravada ordination of bhikkhunis in Indonesia after more than a thousand years occurred in 2015 at Wisma Kusalayani in Lembang, Bandung. Those ordained included Vajiradevi Sadhika Bhikkhuni from Indonesia, Medha Bhikkhuni from Sri Lanka, Anula Bhikkhuni from Japan, Santasukha Santamana Bhikkhuni from Vietnam, Sukhi Bhikkhuni and Sumangala Bhikkhuni from Malaysia, and Jenti Bhikkhuni from Australia. Today, in reference to the principle of Pancasila, a Buddhist monk representing the Buddhist Sangha, along with priest, Brahmin, pastor or representative of other recognized religions, would participate in nearly all state-sponsored ceremonies. The ceremony would always include a prayer (led by a Muslim imam with representatives of other faiths standing in a row behind him). 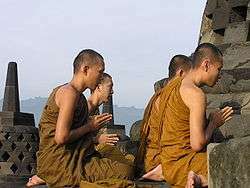 It is noteworthy that, although the majority of Indonesian Buddhists are of the Chinese Mahayana school, more often than not the representative of Buddhism as selected by the Government would happen to be a Theravada monk. Once a year, thousands of Buddhist from Indonesia and neighboring countries flock to Borobudur to commemorate national Vesak ceremony. The oldest extant esoteric Buddhist Mantranaya (largely a synonym of Mantrayana, Vajrayana and Buddhist Tantra) literature in Old Javanese, a language significantly influenced by Sanskrit, is enshrined in the Sang Kyang Kamahayanan Mantranaya. The Lalitavistara Sutra was known to the Mantranaya stonemasons of Borobudur, refer: The birth of Buddha (Lalitavistara). 'Mantranaya' is not a corruption or misspelling of 'mantrayana' even though it is largely synonymous. Mantranaya is the term for the esoteric tradition on mantra, a particular lineage of Vajrayana and Tantra, in Indonesia. The clearly Sanskrit sounding 'Mantranaya' is evident in Old Javanese tantric literature, particularly as documented in the oldest esoteric Buddhist tantric text in Old Javanese, the Sang Kyang Kamahayanan Mantranaya refer Kazuko Ishii (1992). In Indonesia Buddhism is mainly followed by the Chinese and some indigenous groups of Indonesia, with 0.8% (including Taoism and Confucianism) of Indonesia's population being Buddhists. A small minority of Sasaks called the "Bodha" (estimated population: 8000) are mainly found in the village of Bentek and on the slopes of Gunung Rinjani, Lombok. They are totally untouched by Islamic influence and worship animistic gods, incorporating some Hindu and Buddhist influences in their rituals and religious vocabulary. This group of Sasak, due in part to the name of their tribe, are recognized as Buddhists by the Indonesian government. Today there are numerous Buddhist schools established in Indonesia. The earliest school that was established in Indonesia was Vajrayana Buddhism, which developed from Mahayana Buddhism, and which is also the school or path of Tibetan Buddhists without schism. Various temples of ancient Java and Sumatra are Vajrayana. Chinese Buddhism gained followers from Chinese Indonesian populations that began to migrate into the archipelago during the 17th to 18th century. 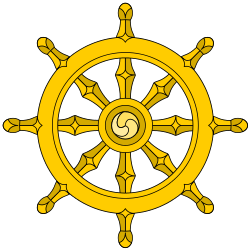 Other notable schools are Theravada from Sri Lanka and Thailand, and Japanese Nichiren Buddhism. Indonesia's most notable Buddhist organization is Perwakilan Umat Buddha Indonesia (Walubi) which serves as the vehicle of all Buddhist schools in Indonesia. Other Buddhist organizations include Majelis Buddhayana Indonesia, Sangha Agung Indonesia (SAGIN), Sangha Theravada Indonesia (STI), Sangha Mahayana Indonesia, and the Taiwan-originated Tzu-Chi. The most important Buddhist religious event in Indonesia is Vesak (Indonesian: Waisak). Once a year, during the full moon in May or June, Buddhists in Indonesia observe Vesak day commemorating the birth, death, and the time when Siddhārtha Gautama attained the highest wisdom to become the Buddha Shakyamuni. Vesak is an official national holiday in Indonesia and the ceremony is centered at the three Buddhist temples by walking from Mendut to Pawon and ending at Borobudur. Vesak also is often celebrated in Sewu temple and numerous Buddhist temples in Indonesia. The Chinese Indonesian community in Tanjung Balai municipality in North Sumatra has protested against the administration’s plan to dismantle a statue of Buddha on top of the Tri Ratna Temple. 1 2 3 "Buddhism in Indonesia". Buddha Dharma Education Association. Buddha Dharma Education Association. 2005. Retrieved 2006-10-03. ↑ Flanagan, Anthony (2006). "Buddhist Art: Indonesia". About. Archived from the original on August 19, 2007. Retrieved 2006-10-03. ↑ "Buddhism in Indonesia". Buddhanet. Retrieved 4 May 2015. ↑ cf. Bunge (1983), chapter Buddhism. ↑ "Vesak Festival: A Truly Sacred Experience". Wonderful Indonesia. Retrieved 4 May 2015. ↑ SHIVA BUDDHA INDONESIA. "SHIVA BUDDHA INDONESIA". ↑ Archived August 29, 2006, at the Wayback Machine. ↑ "Keputusan Bersama tentang Hari Libur Nasional dan Cuti Bersama tahun 2006" (Press release) (in Indonesian). Coordinating Ministry for Public Welfare. Archived from the original on March 7, 2008. Retrieved 17 August 2008. ↑ "The Meaning of Procession". Waisak. Walubi (Buddhist Council of Indonesia). Retrieved 28 December 2008. ↑ Apriadi Gunawan (2010-10-20). "Indonesian-Chinese protest removal of Buddha statue". The Jakarta Post. Retrieved 21 March 2012.